Most of the time, quietness and town or city do not go together. Either it is quiet and the town looks like a ghost town, or the town is lively but far from quiet. I like my relaxation in the weekend and just go far from the house and from the city. Ok, in Winnipeg there are enough quiet places to find, but a bit farther out is always good. Every now and then we take a car to get out, and try to find some nature and calm down from the week’s hassles. Now if you find places like these in this picture, you can imagine that this is not a very hectic place. Well, maybe you’re in for some surprises. The first thing we saw when we turned into Pinawa, MB was that there was nobody in the streets. Ok, some of these towns near lakes and rivers are used for summer occupation. Pinawa is not one of those. It was simply too cold for a Sunday afternoon. So the first thing we did was stop the car, kill the engine and be very quiet. Deer are always very quick to disappear and I didn’t want to miss this opportunity to catch a few with my camera. 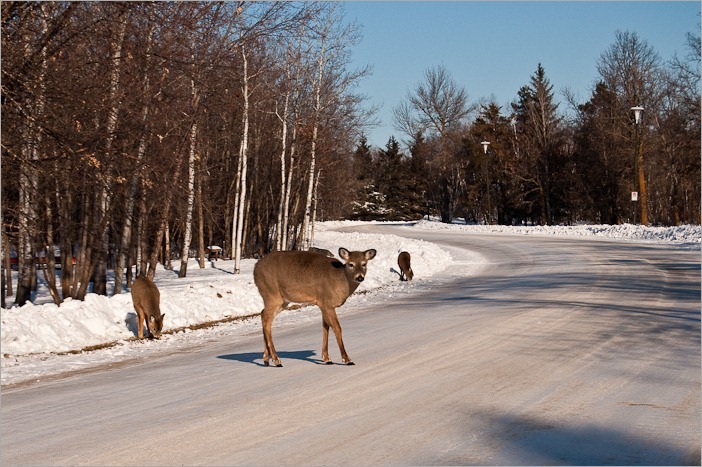 To our surprise, the deer didn’t seem to be afraid at all and started to cross the road in front of our car. Hmmm, definitely something going on here… I hadn’t smoked anything, anyway I don’t smoke, but this seemed unreal! 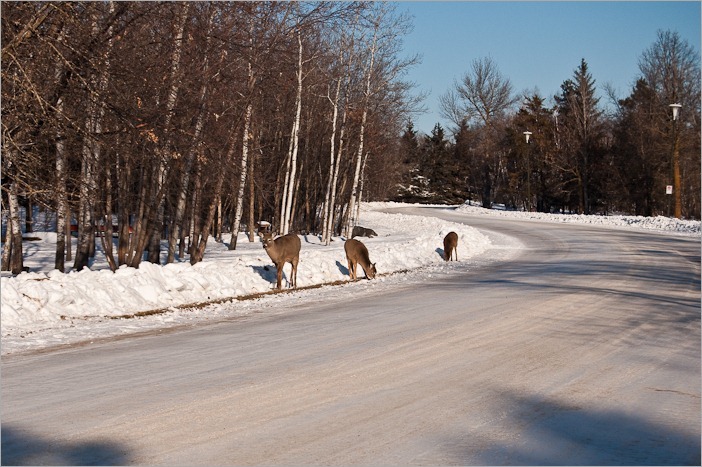 So, after crossing the road, these animals simply started eating some snow on the side of the road, in front of the car. Of course the next impulse is to give them something to eat, so we opened the windows. Obviously they were hungry and not like bears, so our skin was not in danger. 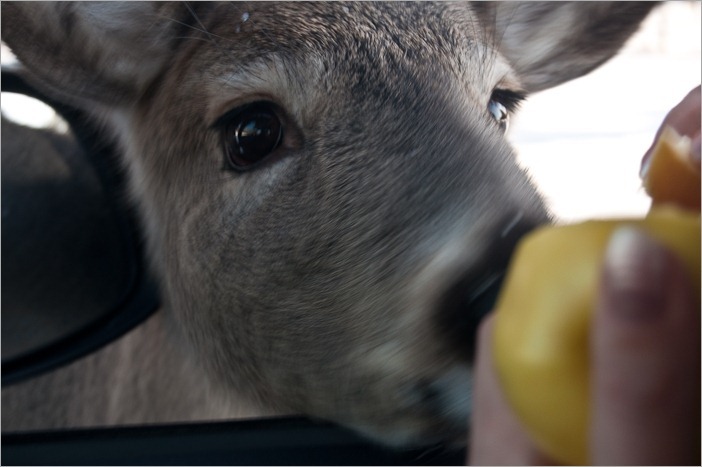 We found an apple, took off a piece and held it out of the window for the deer. The piece of apple was quickly gone. 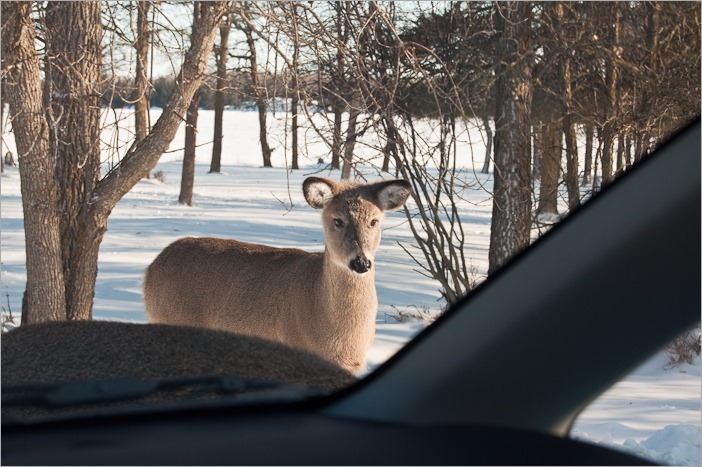 After that, the next deer also wanted a piece. Unlike the first one, it really didn’t care for the small piece of apple, but clearly wanted the rest of it. 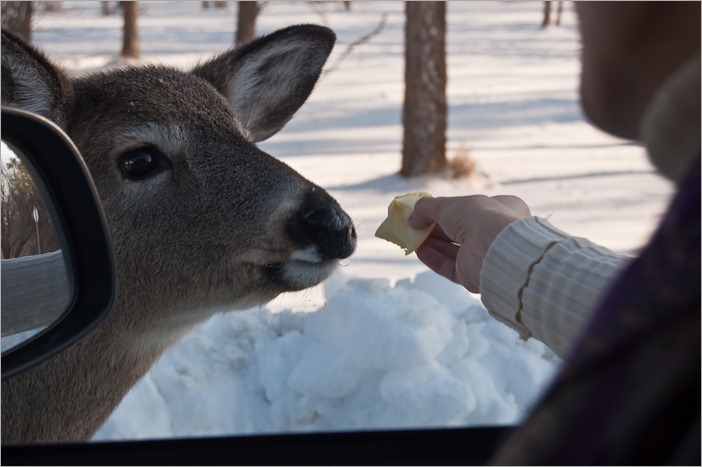 This one looked really intent on getting the BIG piece of apple. 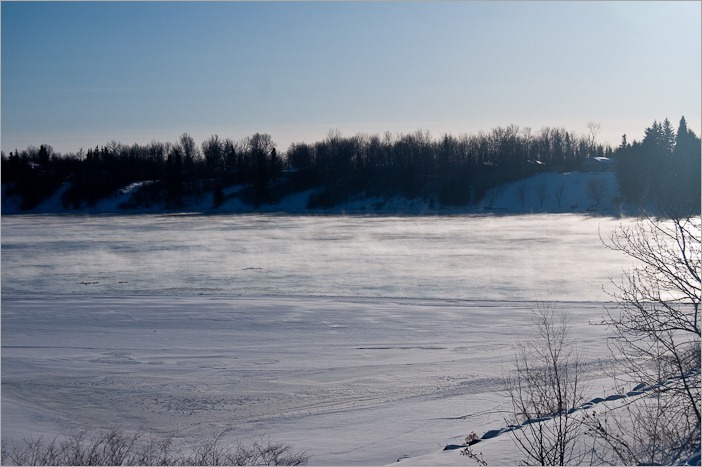 To our surprise, Pinawa was bigger than we thought and we drove to the other end of town. There, we were greeted by more deer. So we just took out our lunch and tried to see if they would like that too. Rice with honey and raisins. 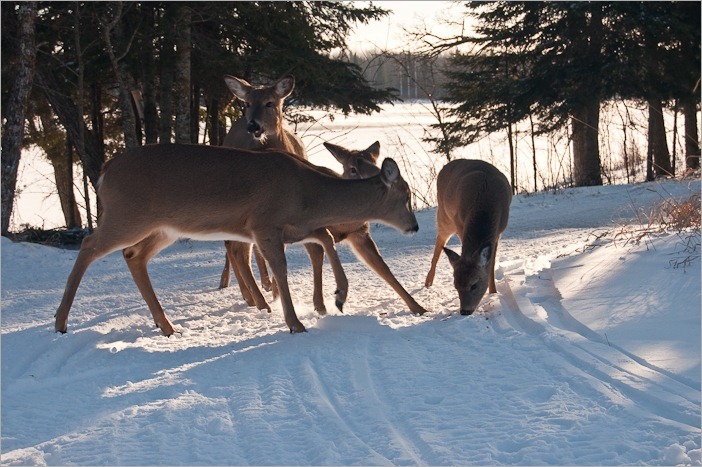 Obviously, deer are herbivores and will eat anything as long as it is not alive and running away (or has been like that). The rice was good, the honey sweet and the deer? Well, probably still hungry. Feeding wild animals is not allowed in most countries, but these animals are hardly wild. It looks as if they would sit in on your breakfast if you were taking it outside on the patio (if the temperatures were not that low). Well, after feeding the hungry animals, they continued their way and we went ours. A thought occurred in my mind, that happens sometimes. Why were these deer here in town together with the people who will be hunting them in a few months? The answer is fairly simple. Nothing to eat in the forest, the town has lots of food, and most important, the law does not allow for firing arms in town. So where will the deer go to be safe from the hunters? In the hunters’ own backyard!